Do you ever feel like the rest of the world has some special knowledge that you lack? Like there was a required class that everyone else went to, but you had a dentist appointment that day? And then no one ever thought to catch you up, because, well, everyone knows that. 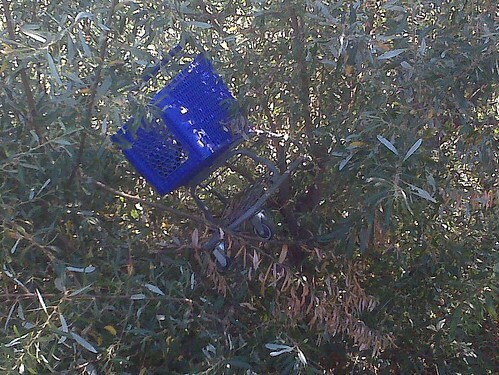 Shopping cart in a tree. In my neighborhood. Yeah. So. The grocery store where I shop for my mom has three kinds of carts. There’s the massive kind with the plastic car thing on front, so in case you have young children you can annoy the hell out of the other shoppers by blocking the aisle (because you need more stress when you are out shopping with one or more young children). There’s the regular giant fatass American-sized cart that is made out of some grey or tan honeycombed plastic type of material, usually festooned with several sheets of month-old store ads stuck together with what appears to be melted and dried ice cream. It is large and ungainly, perfect for the six 12-packs of soda, the giant-sized carton of Hot Pockets and the bale of 48 double rolls of toilet paper that everyone seems to need. And then there are the petite wire carts. These are small carts, the exact size for the few items I need for mom, and nimble and speedy enough to zoom around all of the other store traffic, which I must do, because I Am So Super Important. -CUT- Back to the damned grocery store. They don’t know. Where the carts IN THEIR OWN STORE come from or go to. However, EVERY SINGLE TIME I am in the store, I see people shopping with those carts. They all know where to get the carts. But they can’t tell ME. And I missed the class, apparently. I have asked them where they found the petite wire carts and they always wave their hand in the direction of the other side of the store and say “Over there somewhere.” None of the cart areas ever have one, but other people somehow manage to find them. One time – once – I found a petite wire cart out in the parking lot, its front wheels stuck in a planter to keep someone from having to walk it the 15 feet back to the cart corral helpfully placed in the parking lot to keep people from having to walk the 50 feet back to the front of the store and thus perhaps burn a calorie or two. Love this post. I do have two kids, ages 4 and 5.5 – they only get the behemoth “racecar cart” on very, very special occasions. Seriously, it has to be a birthday, a death or perhaps, daddy is on a stinking business trip before I get out that horrendous thing. I love, LOVE the Teeny Tiny Cart that you mention. We zip through the store with that thing and Double Bonus, the kids can help push it. Everyone wins! I think the problem with the teeny tiny carts is that people steal them. Really. I like the little carts so that Kiddo can push. I usually find then up by the entrance, near the bathrooms. Ralphs! I need to quit shopping at Vons! I hate the car cart. Usually I check to make sure it’s NOT available, then announce sadly that it isn’t. We don’t have petite carts, but I do like the tiny kid carts, which we have at Trader Joe’s. I also like Ikea carts, which can move side-to-side! LOL. I didn’t know the car cart tormented parents, too! I love those little carts, and they are always in short supply. I guess they are put their to make our trip to the grocery like a treasure hunt. I think Von’s is the same store that is called Safeway everyplace else, in which case, they keep the tiny carts right next to the big carts, but they don’t have enough of them. The carts I dislike are the standard-sized ones with a cupholder. The cupholder is right in the middle of the side of the cart, ensuring that your bananas get snagged when being placed in or removed from the cart, and also can people really not get through the 20 or 30 minutes it takes to buy groceries without that extra boost of caffeine? It’s only a matter of time before carts come with attached snack trays and DVD players. I disagree. The cupholder saves me when I shop for Mom at 8 am on Sunday mornings. Having hot coffee makes the whole thing bearable. The little wire carts have a cupholder, too, in an even MORE convenient location. Sigh. One of my grocery stores has a pretty good supply of the tiny carts. It’s the store that I got to mainly because they have milk from a local dairy in glass bottles, so I seldom pick up anything there that won’t fit. Our local Safeway had a bunch of these gorgeous teeny tiny carts, which I adored, and I believe they’ve all gone missing now. You’re right, they get stolen. They were awesome for navigating around the stupid aisle displays of crap they put there to ensure that only one person with a cart can use an aisle at a time. If I can’t find a teeny tiny cart, I use the basket that you carry, and I always end up in pain from getting milk AND a carton of OJ AND a 6 pack of diet coke. Stupid me. Oh, me too. I end up with 60 lbs of stuff in the hand basket.